I’ve mentioned on previous occasions that, quite oddly for a nail blogger or just, you know, a human, I’m not much for beauty stuff on my hands. Lotions? Hardly use ’em. Masks and treatments? Only every now and then. Hand creams? Whazzat? 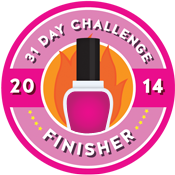 So when the most recent prompt in the Fall Fun Series called for the participants to highlight a favourite body care item, I was flummoxed – my hands-off approach to nail, skin and body care effectively means I have none! Then I remembered that I still have a number of seasonally-scented items from a themed box I purchased from Sunny’s Body Products two years ago, and best of all, they’re all in perfect condition – the fragrance oils haven’t gone skunky, the creams bear no discolouration and a patch test raised no red, bumpy alarms. I’d say these oldies, but goodies, are all cleared for takeoff, to slightly muddle my metaphors. If you’d like to see what I had to say about the Fall box in its original form, you can find that post here. 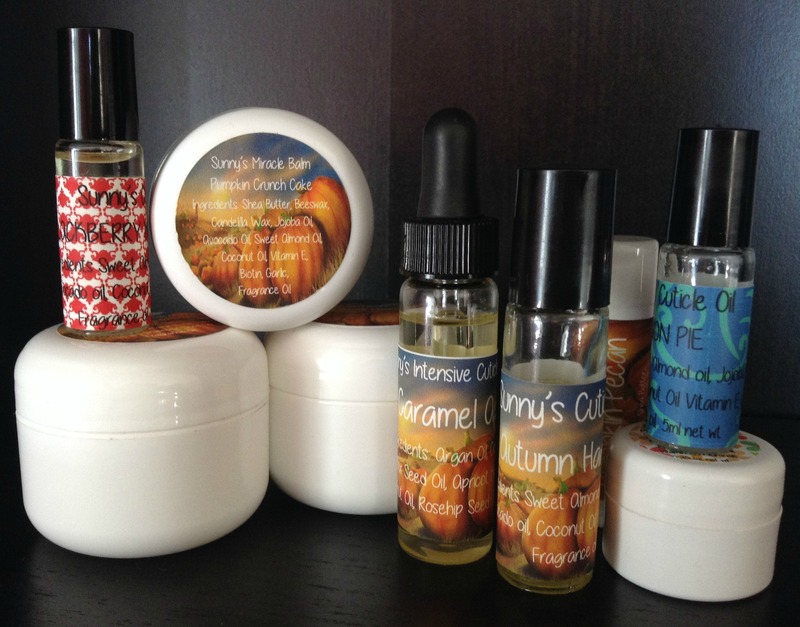 Of the remaining items – intensive cuticle oil in Caramel Apple, sugar scrub in Autumn Mums and cuticle balm in Pumpkin Crunch Cake – I’m most excited to press the cuticle balm into action as a super emollient foot cream. And the scent? Divine. It actually reminds me very much of this white cake my grandmother used to make with hard boiled caramel icing – buttery, pudding-y vanilla. Oh, yum. And while I can’t say I loveity love love the scent of the Autumn Mums sugar scrub, it’s pleasant enough and quite tolerable. And the dabber-topped cuticle oil in Caramel Apple? 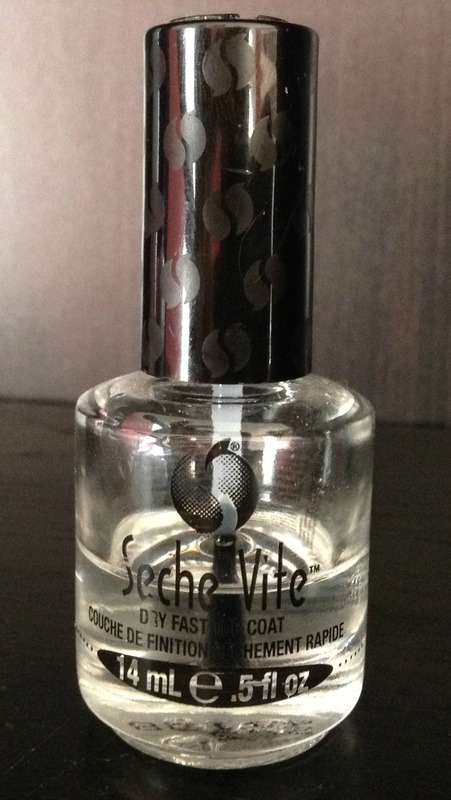 A wonderfully-scented version of the only nail product I use with any regularity. A definite keeper. When it comes to my nails, I’m really not much of a gearhead. Here at Finger Candy HQ, we take a remarkably low key approach to the “stuff beyond the polish” – one pair of nippers, tweezers, a cuticle pusher and a single glass nail file compromise the entirety of my toolkit. More than that, though, what is there is not of the greatest quality – bits and pieces I cobbled together from cheapy gifted sets. 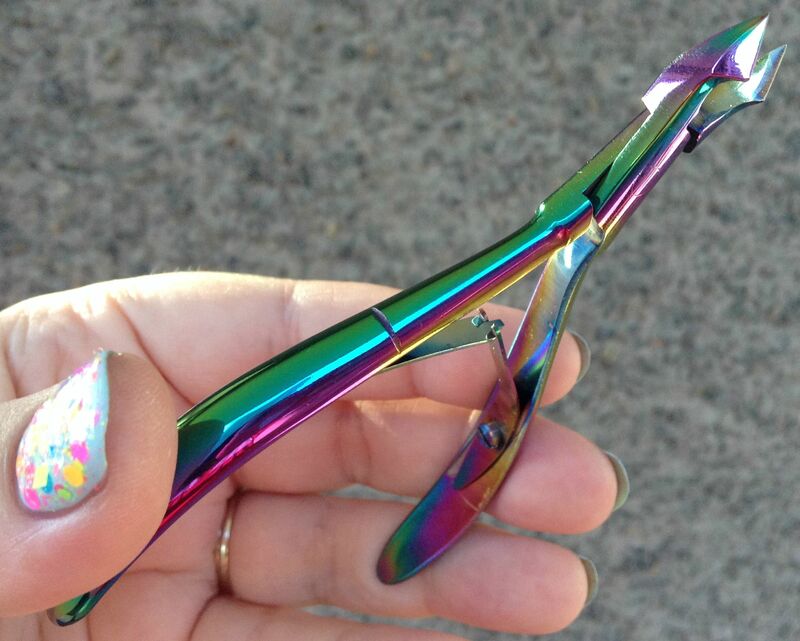 So when KB Shimmer recently released a gorgeous set of chromatic rainbow tools – nippers, two types of tweezers and a cuticle pusher – I jumped at the chance to round out my kit with some quality nail care implements that just so happen to be eight shades – literally! – of colour-shifting, chromatic goodness. Let’s take a closer look at some of these pretties, shall we? KB also released two sets of tweezers, slanted tip and needle nose. I don’t have much use for needle nose tweezers, as I don’t do a lot of charm and other placement work, but given the size of my eyebrows, there will ALWAYS be work for slanted tip tweezers around my house. I also find slanted tips to be a little more sturdy than their needle nose counterparts. 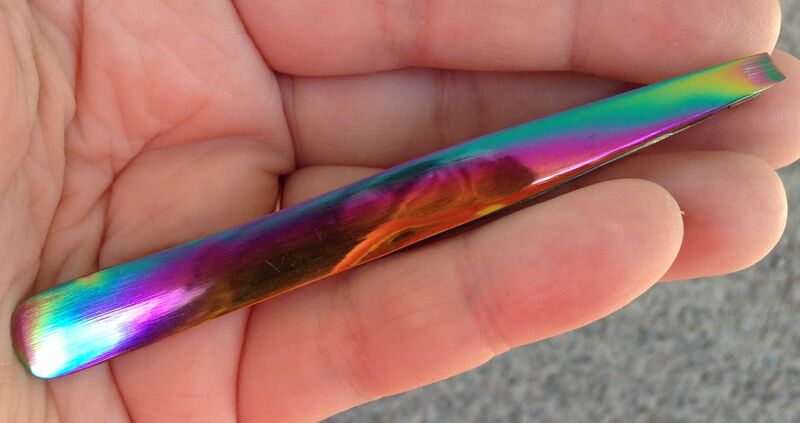 These rainbow tweezers are particularly nice, with a good, strong edge for picking up the tiniest of things. This double-ended AND double-edged tool is a cuticle pusher on one end and a freakin’ ice pick on the other (I think it’s actually just a general cleaner-upper, but I can’t shake the feeling I just bought the REAL Mr. Pointy.) Fun to note: Despite these tools shipping from Canada to Canada (within the same province, actually), my package was opened, this item in particular, and inspected by the fine folks at Canada Post. 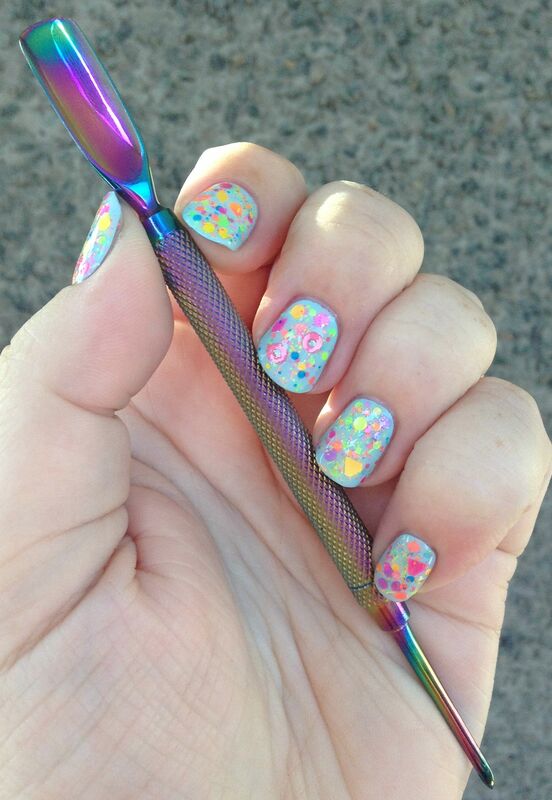 I really hope they tried out the cuticle pusher, because it is a great one – it looks like it would be all sharp edges, but the rainbow-coated metal is nicely rounded and smooth. You can find these three nail care tools and their absentee, needle nose friend on KB Shimmer’s site here, as well as through Harlow & Co. here. I’m always somewhat hesitant to recommend a specific product, company or retailer because I have found that everything that’s said about one person’s trash being another person’s treasure holds absolutely true, particularly in the world of beauty-based retail. On the balance of probabilities, purely from a numbers standpoint, one or two people are going to have a negative experience with a company or a product that I can’t say enough good things about, and vice versa. It’s an inevitability, and excepting cases where the quality of a product or a company’s services are indisputably – by anyone’s standards – garbage, it’s really something of a personal preference crapshoot. We all march to the beat of a different drummer (Travis Barker is my life’s drummer, in case you were curious), or, to cycle back up to the top of this paragraph, trash/treasure. But over the course of my rather short nail art “career” I have run across a number of excellent, can’t-live-without-em products and retailers, and I would be remiss – REMISS! – in not sharing the love, with the hope that you find them just as great as I do. And in the interest of not swamping you with 8,657 rhapsodizing words on the subject of nail art and nail art-related products, I am going to split this post into a few different sub-posts, starting with some of the behind-the-scenes goodies of the nail art world. For someone who sops her hands in noxious chemicals nearly every single day, I have a remarkably casual approach to nail care. As in up until about a year ago, I just didn’t. I’ve never been a huge fan of hand cream (to mangle a joke from the Big Bang Theory, why do you want your hands to feel like veal?) and at first I thought that my cuticles were just fine, thank you very much (they weren’t.) But I quickly came to realize that a consistent approach to hand and nail care keeps the raggedy bits at bay, and I now make sure to treat my mitts to multiple daily doses of soothing, delicious-smelling hydration. To that end, I pretty well exclusively use a range of items from Sunny’s Body Products, an indie retailer I have sung the praises of before. Sunny’s offers a number of products, from lip balms and bath whips to sugar scrubs and lotions, although I’m partial to their cuticle oils and balms, rich, emollient concoctions of nourishing oils in your choice of (as of the writing of this post) over 400 unique scents. I particularly like that Sunny’s offers nearly all of their products in generously-sized sample packs, so you can try out all sorts of wild and wooly scent combinations without a massive financial outlay. My Sunny’s stash, as it’s known around Instagrammy parts, is downright small – a few oils, a couple of creams, a lush lip balm – but I do have a favourite product and scent in Sunny’s Cuticle Oil in Autumn Harvest, a rollerball-topped applicator filled with all sorts of good-for-you oils in a sweet and spicy, gorgeously gourmand scent. If all of that sounds delicious to you, you can purchase Sunny’s products through their site here. You should do it. Always. It takes seconds (unless you’re tidying up after a water marble) and displays a level of care for your work (and anyone else staring at your hands) that’s just plain old nice to see. 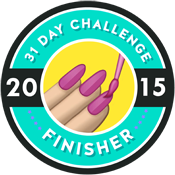 I clean up all of my manis by dipping a small, flat-headed brush into pure acetone before running it around the edges of my nails. It’s a great, simple technique for tidying up the occasional blip and blob (and believe me, even two years in there are still PLENTY of blips and blobs), but it’s also quite drying, so you’ll want to dab on a bit of oil to soothe the savage cuticle beasts (one of Sunny’s magic potions, perhaps?) 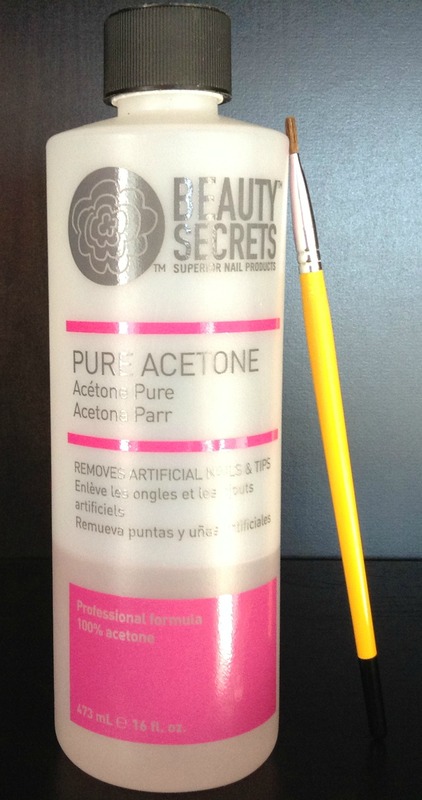 My small brush (actually not small enough, but it’s due for a tinier replacement pretty soon) comes from Michael’s, and the acetone I use, Beauty Secret’s pure acetone, is another product available at Sally Beauty Supply. That’s all the wisdom I have to drop on you today, but as all the great TV shows say, to be continued! Hand care, that is. If you spend any time scrolling through the offerings on Instagram or perusing other beauty and nail blogs, you may have run across mention of Sunny’s Body Products. Run by one super hard-working lady, Sunny’s is an indie beauty product manufacturer offering a wide range of body and nail care products in just about every delicious scent under the sun (because as nice and legion as Sally Hansen’s apricot cuticle cream is, wouldn’t you like to bathe your fingers in the scent of, say, gingerbread cheesecake every once in a while? I know I do.) Sunny’s offers all manner of good-for-your-hide products at super reasonable prices, from cuticle balms and oils to buttery hand creams and body balms, all customized to the scent of your choosing (and if you think choosing yogurt is difficult – I just about have a panic attack every time I buy yogurt; there’s just too much stupid choice – try whittling down your list of “must trys” from Sunny’s spreadsheet of nearly 350 scents.) And because Sunny’s offers its products in a number of generously-sized sampler packs, you can try out all sorts of scents and see what truly strikes your fancy. I passed on the first summer and Halloween boxes, being already quite flush with hand care products of a Sunny’s nature, but I couldn’t say no to the Fall box, what with its perfectly prejudiced preference for pumpkin and my overwhelming weakness in the face of spicy/bakery-type scents. I was also very nearly out of the aforementioned apricot cuticle cream (funny story – apricot is just about one of the only scents Sunny’s doesn’t offer.) This particular box is no longer available and the recently released Christmas box is currently sold out (although I believe Sunny’s has a second release planned), such is the rabidness, shall we say, of Sunny’s fans. 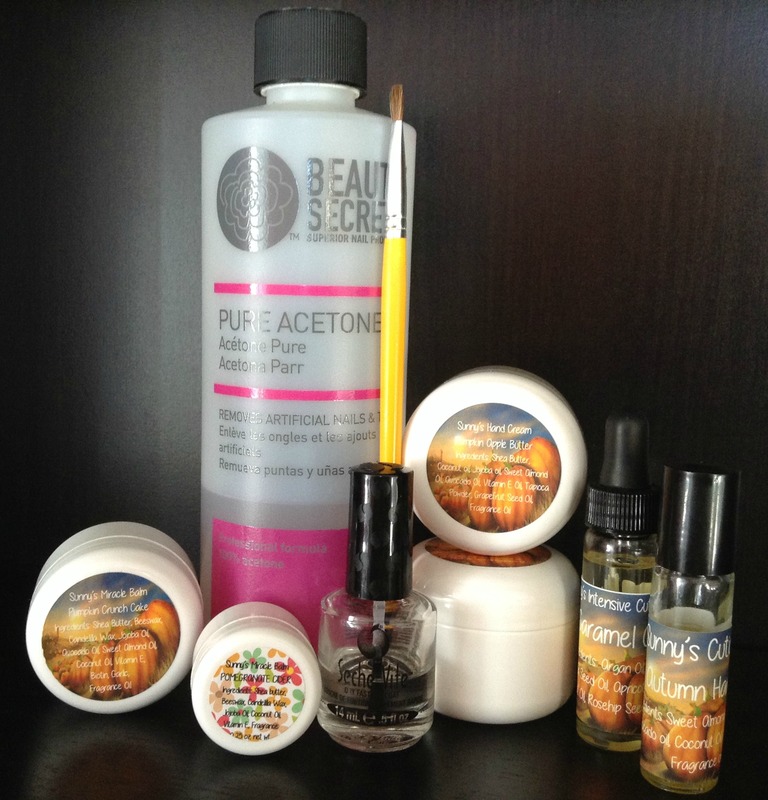 But in a good way, because her products are really quite terrific and effective, in addition to smelling simply divine. 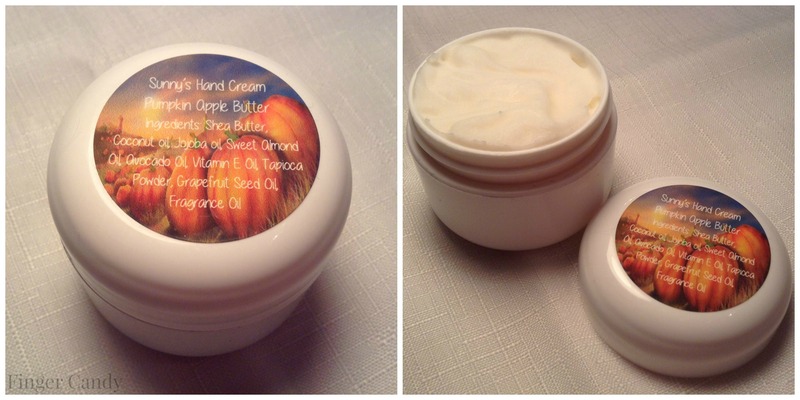 First up we have a one ounce pot of Sunny’s Hand Cream in pumpkin apple butter. Recently re-jigged as hand butter, this super smoothing, semi-solid cream (“butter” really is the appropriate term) saved my uncomfortably cracked feet when no other product could achieve the same – ha – feat. I just made slathering a coat of this cream on my tootsies a daily event, and in next to no time I had trotters I wasn’t ashamed of, uh, trotting out in public. This cream smells delicious, too – a slightly fruity, slightly spicy combination of the season’s most delicious, warm scents. 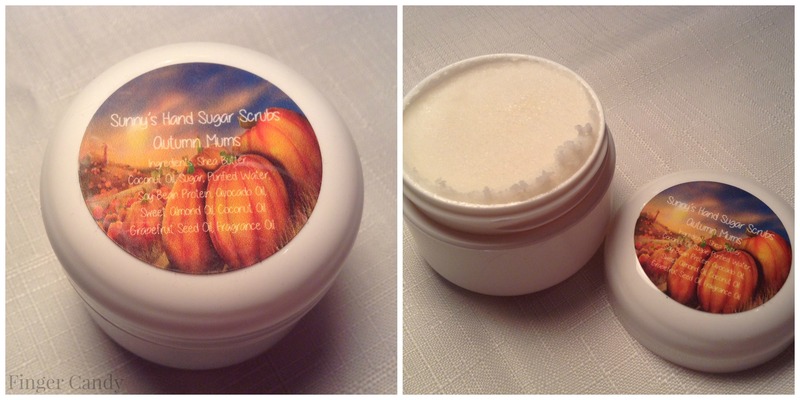 Next up is Sunny’s Hand Sugar Scrub, a simple, super moisturizing exfoliating scrub in autumn mums. The scrub itself is nice and not too scratchy (although be careful when you use these types of oil-intensive products in the tub or shower – they can leave a very dangerous film of oil on the bottom of your tub) although I’m not the hugest fan of the scent – florals just ain’t my jam. This one’s getting re-gifted to my grandmother, who does enjoy floral scents. 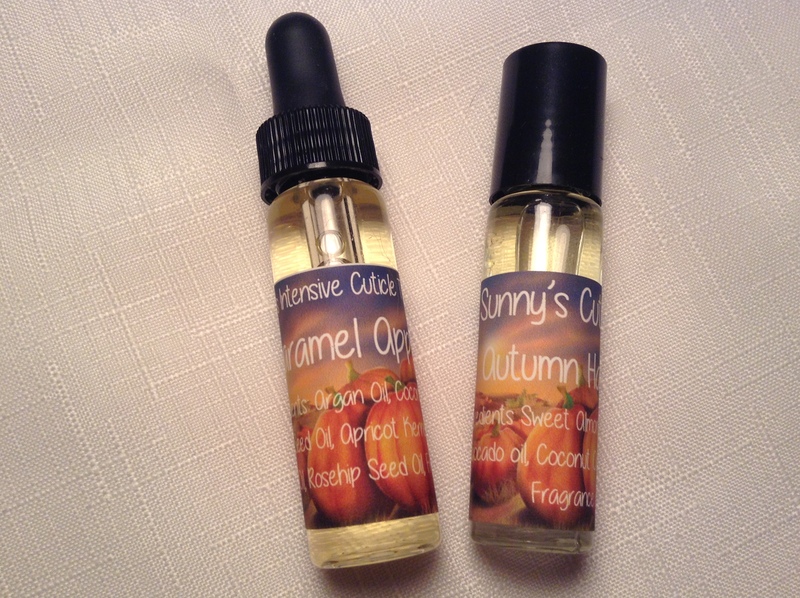 In fifth place, and without its own solo shot, we have Sunny’s Lip Saver in pumpkin pecan. When I was in high school and university I was crazy for lip balm. In fact, a mutually obsessed friend and I were recently joking that we’d find random lip balms in pockets and bags and purses long after we thought we had lost them – it was like they were breeding (life finds a way?) But in recent years I’ve lost the lip balm bug (I think it was the advent of those super glossy, ultra gloppy, mega plumping lip glosses that dominated the beauty scene in the early 2000s – looking like the victim of a Tijuana back alley plastic surgeon is NO ONE’s best look) although this lip balm could convince me to start carrying again. Colourless and satiny, Sunny’s Lip Saver is that perfect blend of hydration and texture – as in it has absolutely none and makes your lips feel fantastic. Saved, even. 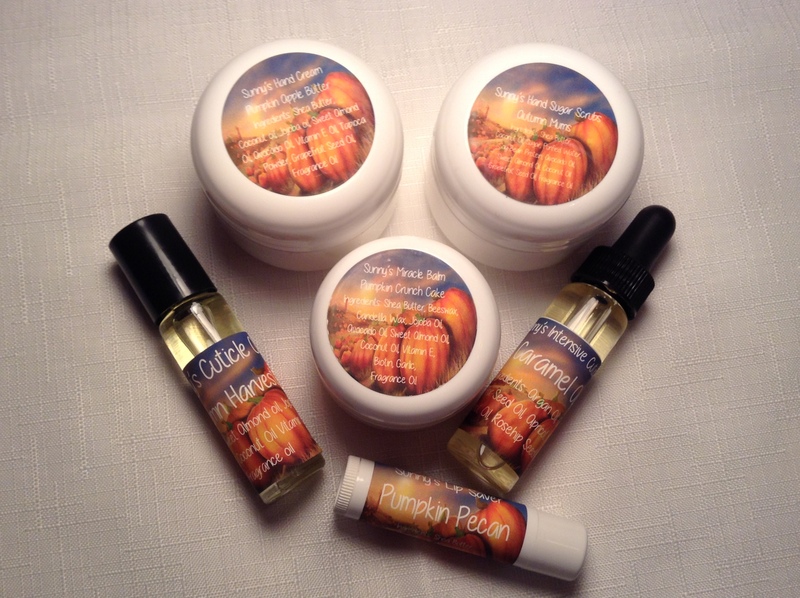 The pumpkin pecan scent is really lovely, too – slightly peppery and a little bit nutty, with just a hint of vanilla. A nicely complex scent for a lip balm. 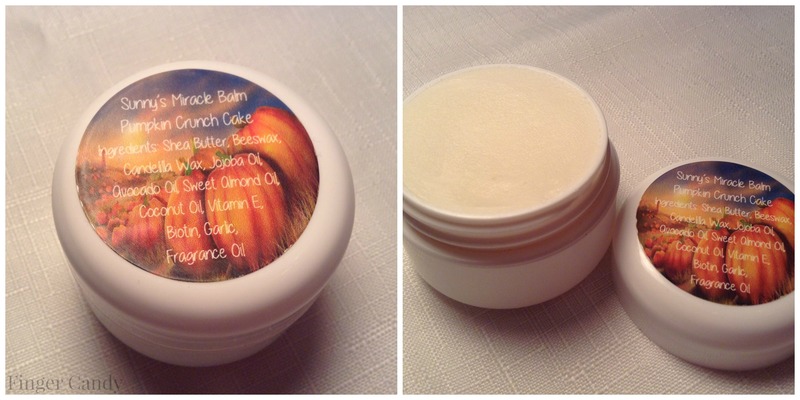 Finally, saving the best for last, we have a full sized pot of Sunny’s Miracle Balm in pumpkin crunch cake. This not-too-greasy cuticle balm is fantastic no matter the scent, but I’m delighted to have a big ol’ container of the stuff in pumpkin crunch cake, as it reminds me of this tooth-rottingly delicious white cake with boiled caramel icing my grandmother used to make for any old day ending in Y. Love it. Love all of it!